Flash floods cause transportation issues and damage buildings in Ankara, the capital of Turkey. 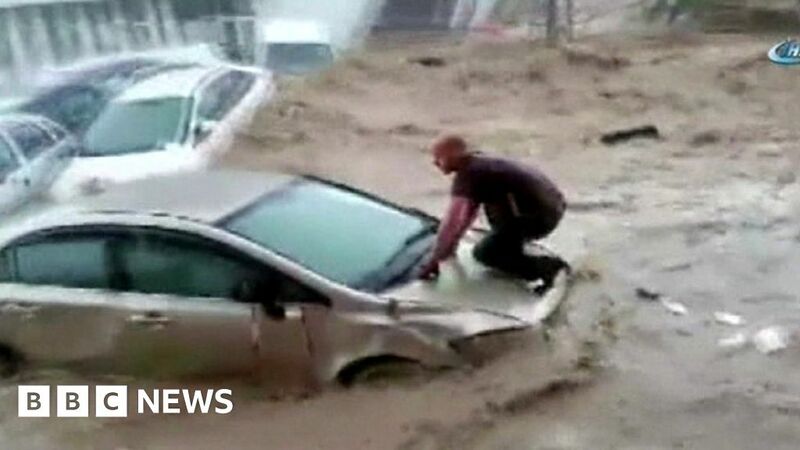 Flash floods in the Turkish capital, Ankara, cause havoc. 2018-12-13 A high-speed train crashes at Marşandiz railway station in Ankara, Turkey, killing at least nine people and leaving dozens injured. 2018-08-20 Two men are detained in Ankara, Turkey, after shots are fired at the United States embassy. 2018-04-4 The leaders of Iran, Turkey and Russia meet in Ankara. They declare their commitment to achieving a "lasting ceasefire" in Syria. 2018-01-13 A Pegasus Airlines flight from Esenboğa International Airport in Ankara, Turkey, departs the runway of Trabzon Airport in northern Turkey upon landing. All 162 passengers, two pilots, and four cabin crew evacuated the aircraft, a Boeing 737, unharmed. The local government launched an investigation into the incident. 2017-03-13 Turkey bans the Dutch ambassador, Cornelis Van Rij, from returning to the Embassy of the Netherlands in Ankara, and closes its airspace to Dutch diplomats in response to a Dutch ban on Turkish ministers speaking at pro-Erdoğan rallies.